Yew's short sleeve Everywear top is a performance top to use for any active sport. 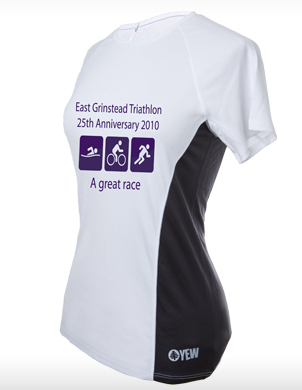 This one is a special shirt to commemorate East Grinstead Tri Club's 25th Anniversary Triathlon on May 16th 2010. Both East Grinstead Tri Club and Yew will be making a donation to the race's charity, the Prostate Cancer Charity, for every shirt sold. We're even offering it at a special price that is more than 50% off Yew's normal tops, so don't forget to order your souvenir race shirt! This is a limited offer, so please get your order in early. 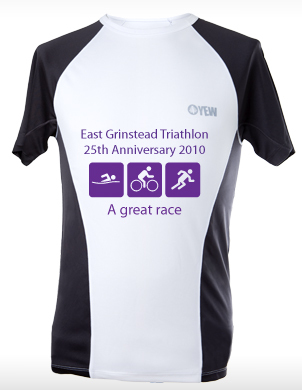 This order will be processed by Yew Clothing, but is sold by East Grinstead Tri Club.